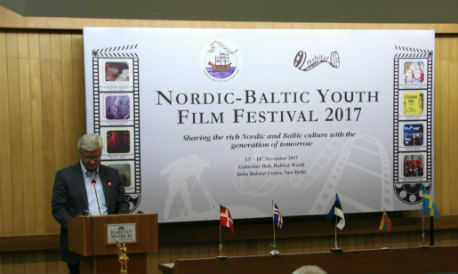 New Delhi: Nordic and Baltic Embassies in New Delhi are hosted the first ever Nordic-Baltic Youth Film Festival in Delhi, drawing a huge number of film lovers. The 6-day festival, being organized in collaboration with India Habitat Centre, will conclude on 18 November. An Oscar-nominated film “Land of Mine” about young German prisoners of war who, after World War II, were forced to clear a beach from land mines by a Danish Sergeant, was screened on the inaugural day today at 06:30pm. Ambassadors from Nordic and Baltic Embassies, including H.E. Mr Peter Taksøe-Jensen, Embassy of Denmark, H.E. MrRihoKruuv, Embassy of Estonia, H.E. MsNina Vaskunlahti, Embassy of Finland, H.E. MrThorir Ibsen, Embassy of Iceland, H.E. MrAivarsGroza, Embassy of Latvia, MsAgnėSakalauskaitė, Charge d’Affaires, Embassy of Lithuania, H.E Mr Nils RagnarKamsvåg, Embassy of Norway, and H.E. Mr KlasMolin, Ambassador Designate, Embassy of Sweden, graced the event with their presence and lighted up a lamp together to inaugurate the Film Festival. Embassies of Nordic and Baltic countries (Denmark, Estonia, Finland, Iceland, Latvia, Lithuania, Norway and Sweden) are tied together geographically and historically through trade, culture and many common yet diverse value systems. Through this film festival, the Nordic and Baltic Embassies carry the bond further, reaching out to the culturally rich Delhi audience. This platform offers a great opportunity for Nordic and Baltic countries to reflect on the similarities and appreciate their differences. It will also prove to be a platform to enhance people-to-people relations and share the thrill, excitement and experience of watching films together. The festival offers a diverse mix of some of the most celebrated and Oscar nominated movies from the Nordic-Baltic region. The films are a collection of dreams, passion, fear, fun and joy. From action movies to family films to documentaries, the collection offers something for everyone’s taste.